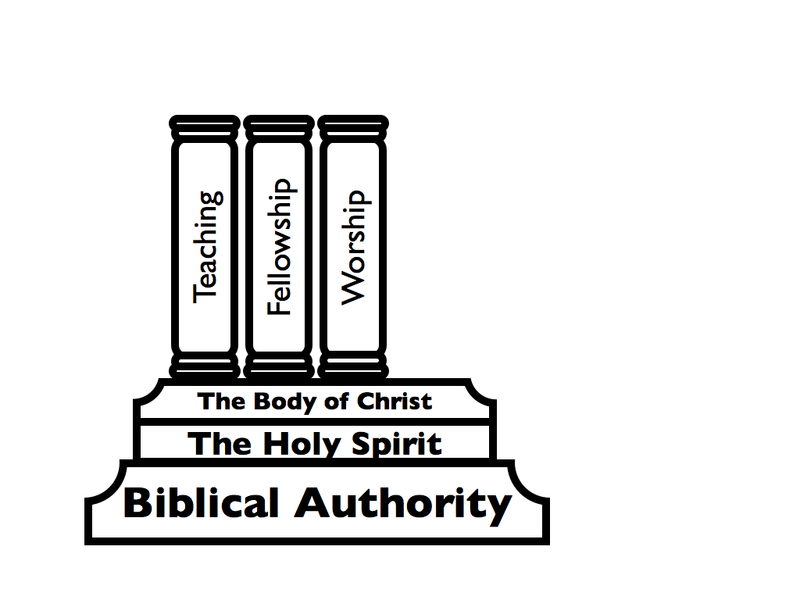 After looking at the authority for the church in the Christian’s life, it is important to consider the elements that make up the church. There are four basic essentials that sort of create the structure for this institution. They are the reasons why the church was called out of the world and why they assemble together. We often call these elements the four pillars of the church: Teaching, Fellowship, Worship, and Evangelism. In Luke’s account of the Acts of the Apostles he provides for us a sort of outline for the early church. This is a preacher’s gold mine because the points are laid out so clearly, but it’s not enough to simply suggest that this is the bedrock structure for the church without seeing if they are consistent with the rest of Scripture. The first pillar is teaching. The church is supposed to be a place for training and developing the faith of believers. The epistles are consistent with the importance of teaching. Paul is very instructive to the churches. We see that the Bereans were commended for their earnest studying. Paul challenges Timothy, a pastor, to be faithful in preaching and teaching the Word. 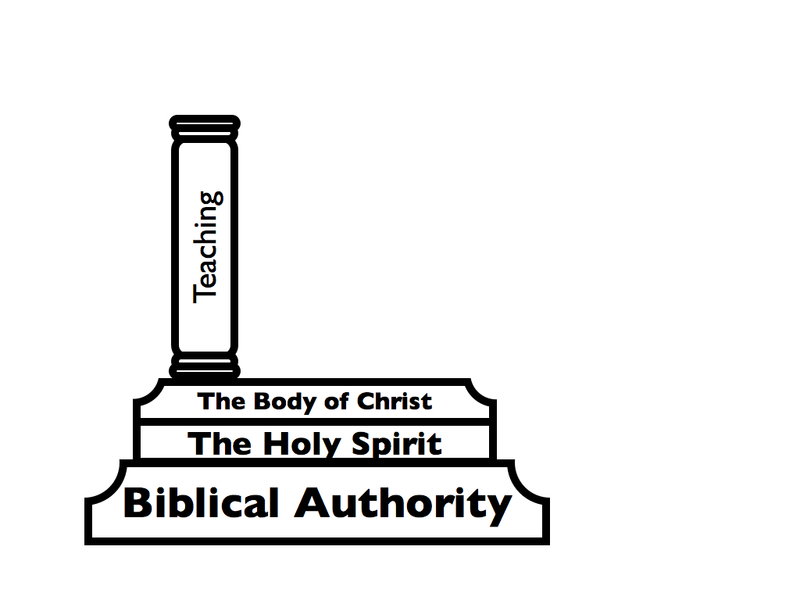 The apostles were teaching on the authority of the word of God, so that is why all four pillars are founded on biblical authority. The second pillar is fellowship. Churches are more than just a consortium of people gathered together like a country club. They are the Body of Christ when they are together. Fellowship is an essential means of the church in discipleship. Yes, discipleship is an aspect of teaching, but being in someone’s presence and rubbing shoulders with them is one of the most powerful tools in one’s development. You can see this more fully in my truth paradigm. The book of Proverbs teaches us that multiple counsellors provide safety and friends sharpen each other’s countenance. Paul writes in his epistles about how he longs to fellowship with the churches and believers. It is clear that the early church spent personal time with each other in the book of acts because they shared their possessions, met in each other’s homes, and ate together. The third pillar is worship which is broken up in two sections: communion and prayer. It is true that worship can and should be practiced everywhere, but it is one of the reasons why the church is gathered together. Communion is the act of worshiping on the sacrifice of the cross. Prayer is an essential tool for the body as they gather to pray for discernment, wisdom, eyes to be opened, and the gospel to go forth. Too often prayer meetings resort to prayers about so-and-so’s niece’s father-in-law’s unspoken request. While personal request should be bathed in prayer as well, corporate prayer time should be focused on and given to the needs, ministries, and objectives of the church. Several times throughout the epistles, Paul addresses the importance and reverence of the communion table. He even warns those who would partake without examining their hearts. Paul certainly stresses prayers as well and models it for them. The book of acts is filled with the testimony and power of prayer. The fourth pillar is evangelism. The great commission was given to the church to spread the good news of Christ’s redemption. It is essential that the Church be a catalyst for leading the charge in reaching their communities, their areas, and the world with the gospel. This was the failure of the Pharisees. They kept their religion to themselves and were not a testament to the other nations. Christ calls us to be both salt and light to this world – piercing the darkness and preserving those we touch. It seems rather odd then that after the dawn of social networks and mini-blogging that the gospel hasn’t spread more rapidly out of mere convenience. 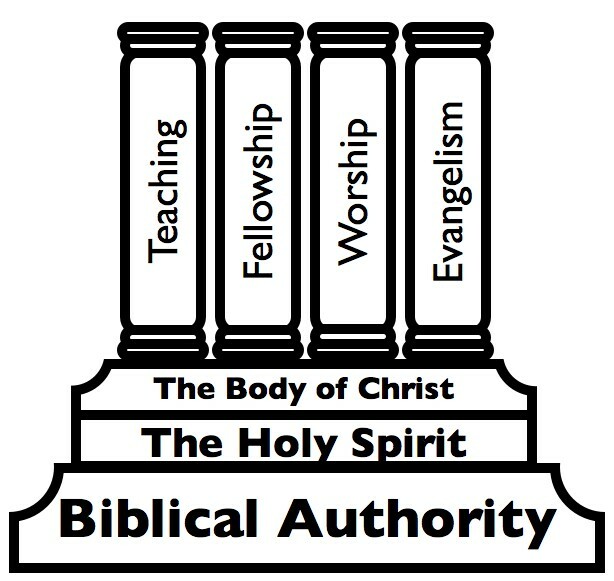 Often times, evangelism is not included in the teaching of the four pillars because it is assumed that it happened naturally in the text of Acts 2. But people were not miraculously showing up at the homes of believers and inviting themselves into the fellowship of the church. There was a definite proclamation of the gospel which is evidenced all throughout the book of Acts. Years back I surveyed a church and asked them where their church measured up on these four pillars. There was definitely consensus that the church was lopsided. Too much teaching and not enough evangelism is a mark of an unhealthy church. All worship and no teaching is a mark of an obese church. I think you get the picture. In order to sustain a vibrant and healthy church, a balance and bolstering of each pillar is needed. Having all four pillars in harmony is difficult, and in many cases it will require stepping out of your comfort zone or entrusting the responsibility to someone else’s care. But when the spiritual health of a congregation is at stake, we should be dedicated to whatever it takes to provide a solid structure. 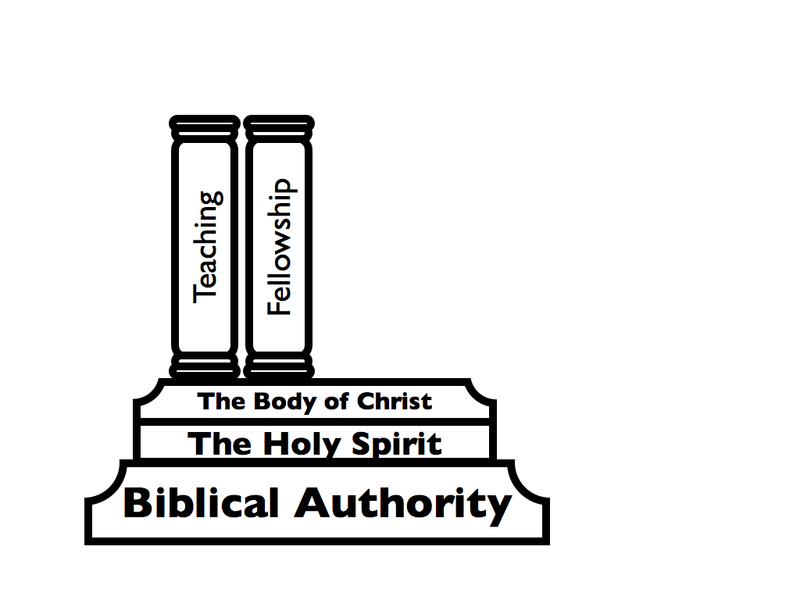 *Note: When it comes to teaching about the four pillars of the church, there will be variances among different scholars. Some will see three, others will see five. For the most part we are all agreeing on the essentials of what structures the church needs and why the body gathers together. Some substitutions you will find on the four pillars are: preaching, prayer, communion, etc. I simply think that the four pillars I stated above are sufficient and concise. While not mentioning preaching, it is a facet of teaching and evangelism. I combine prayer and communion under the pillar or worship. I would not discredit anyone who had a different take on the pillars of the church as long as these four were acknowledged in some way in the structure of the church. **2nd Note: This is not to be confused with the four pillars of the Catholic church – The Apostles’ Creed, the Seven Sacraments, the Ten Commandments, and the Lord’s Prayer. Gallery | This entry was posted in Theology and tagged church, evangelism, Fellowship, Missiology, Teaching, Worship. Bookmark the permalink. This is an organizational view of the mainstream church’s paradigm, which is totally flawed and failing more everyday with 6000-8000 churches closing every year. The reformation exchanged the priest for pastor and the Eucharist for teaching, but pretty much the rest of the job description remained the same. The mainstream church has placed the pastor in a non-biblical role and created Christian celebrity and its natural bent for self-gratification, hence the false prosperity movement, which just lines pastors pockets. Less than 1% of what is taken in through offerings ever reaches the unsaved people groups of the world. The current paradigm operates as if Matthew 18:3-4, Matthew 23:8-12, 1 Corinthians 12:22-27, 1 Corinthians 14:26, and Philippians 2:3 were not even in scripture. The teaching is not systematic theology (the whole counsel of God on each subject), but rather selective theology designed to support the carnal and business agenda of the corporate church. Pastors have become CEO’s rather than the towel and bowl folks they should be and no longer engage in discipleship as they don’t have time due to conducting church business. In fact, true discipleship, which was the dynamic that God designed to teach convenant relationship to believers has all but totally disappeared. Fellowship is first and foremost being in right relationship with God as a lifestyle through 1 John 1-9 and having no unconfessed sins not a covered dish social. Most churches do not even address sin whatsoever anymore. Worship (see where the term was first used in scripture in Genesis 22:5) is bowing down our will to God’s will. We worship God with our obedience (1 Samuel 15:22, Romans 12:11-2). Today will lift up unholy hands that are seeking after the American Dream and that serve the world system and expect God to hear. “So when you spread out your hands in prayer, I will hide My eyes from you; Yes, even though you multiply prayers, I will not listen. Your hands are covered with blood. (16) “Wash yourselves, make yourselves clean; Remove the evil of your deeds from My sight. Cease to do evil” (Isaiah 1:15). Evangelism is a joke. Barna survey indicated that only 5% of professing Christians in this nation have ever shared their faith with a single lost person. You will never have effective evangelism until you have effective discipleship. For God’s sake, 85% of the children raised in the church leave organized religion between 15 and 25 years old. In fact again, Barna surveys indicate that the vast majority of Christian parents don’t have a plan for their own children’s salvation or play apart in their spiritual education.